Jennite has been the gold standard in paving and sealcoating products for over 70 years. To maintain the highest standards of quality possible, Jennite allows only its specially trained and licensed contractors to purchase and apply its superior pavement coating products. In Florida, Liberty Sealcoating is the company to contact for Jennite quality and endurance. Up to three times the durability of other pavement coatings. It's the protective coating your Florida parking lot needs to maintain its strength and clean appearance even during the hot summer months and hurricane season. The ultimate protection from oil, gasoline and chemicals. Jennite's high solids, polymer modified formula fights stains and damage from leaks and spills. A safe pavement that is easier to keep clean than other asphalt surfaces. The Jennite System gives your parking lot a seamless, skid-resistant and even-textured surface. A lustrous black finish. 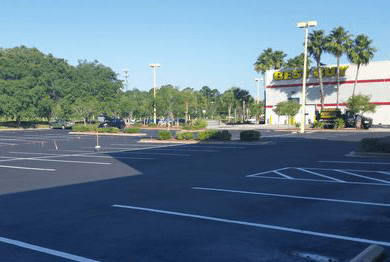 Jennite's tough waterproof seal resists cracks and fading longer than other pavement coatings, so your parking lot will look good even in the Florida heat. Guaranteed quality. With the Jennite System, you get a written dual performance warranty for the product and the installation. Florida's hot sun and heavy rains can be particularly damaging to asphalt pavement, causing it to fade and weaken over time. For the ultimate protection for your parking lot, make sure you ask for Jennite. It is the premium quality pavement coating that can be applied without dilution and that has greater compatibility with asphalt surfaces than other sealcoating products. For the best sealcoating in Central Florida, contact your certified Jennite contractor, Liberty Sealcoating at 1.888.957.2836 or submit our Free Estimate form online.